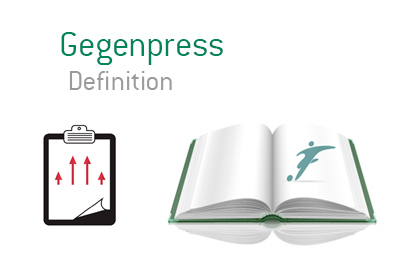 Gegenpress Definition - What Does Gegenpress Mean? What is the meaning of Gegenpress in the sport of football? Gegenpress is a high pressure defense, loved and often utilized by a German tactician and present manager of Liverpool FC, Jurgen Klopp. The basic idea of Gegenpress is that after losing the ball it is best to high-press the opponent while they still haven't figured out exactly what to do with it. This strategy involves a lot of running and requires a high level of focus by each team member. The defensive line is played high and players hunt for the ball in packs. The aim is to regain possession as far up the pitch as possible. Playing Gegenpress can be effective if done right. This strategy also brings risk as it leaves little room for error. All opposing players must be covered at all times. If an opposing player manages to break away, things could get costly with just one well executed pass.